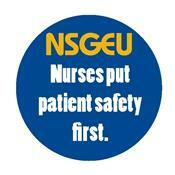 The NSGEU is campaigning for the introduction of nurse-to-patient ratios in our public healthcare system. 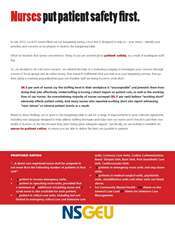 We believe nurse-to-patient ratios are essential to providing a safe level of care. Our hospitals and community health services have been plagued by underfunding and a shortage of nurses for a long time, and with many experienced nurses set to retire in the near future, the problem is only going to get worse. Your community deserves better. Our plan provides an appropriate ratio of nurses to patients. For example, on a typical medical or surgery ward, there would be one nurse for every four patients. Our ratio plan guarantees minimum numbers only, but can be adjusted to meet higher patient acuity. It also allows for flexibility so nurses can use their professional judgment to determine appropriate levels of care. 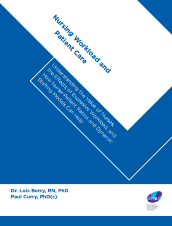 A healthier & more sustainable nursing workforce. “Nursing demands will cost $60m to meet, health officials say” CBC, February 11. “Nurses’ contract includes 7.1 per cent increase” The Chronicle Herald, November 1, 2011. “Are Nova Scotia nurses and doctors burned out?” Global News, April 24, 2013. Local 97 Campaign Fact Sheet, please click here for pdf version. Key Findings Report, please click here for pdf version. 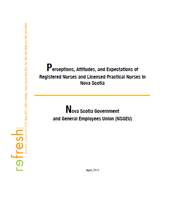 CFNU Workload Report, please click here for pdf version. Benefit of More Nurses, please click here for pdf version. 6. Six patients in HI 8.4 Medicine on nights only, 6 Lane on nights only and 7 Lane on nights only. (c)	Except as otherwise written in this Article, the staffing plan shall provide that, at all times during each shift within a unit, a team of two Direct Care Registered Nurses and one OR Tech shall be assigned no more than one patient in Operating Room Units subject to paragraph (e).